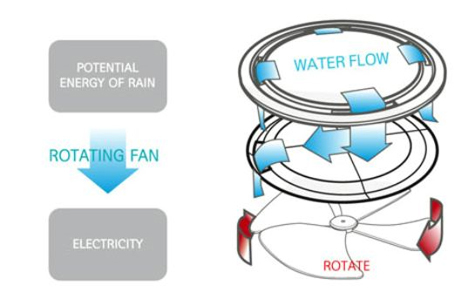 Rainwater-Powered, Direction-Giving Manhole of the Future? Not all industrial design is built of good, usable concepts. Some are merely explorations of what could be done, not necessarily what should be done. 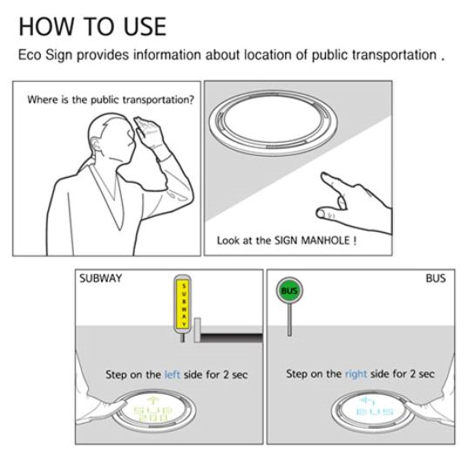 Case in point is the Eco Sign, designed by Cheolyeon Jo and Youngsun Lee. On the surface, it’s actually a pretty ingenious concept: a ubiquitous urban object turned into a useful directional sign. Simply apply pressure to one side or the other, and it tells you how to get to the nearest subway or bus station and how far you’ll have to walk to reach them. The device is powered by rainwater, so it doesn’t use any of the city’s electricity. But then you realize that the urban object in question is a manhole cover. In most cities, manholes are located in the middle of busy streets, making it extremely dangerous to stand over one looking down for any length of time. Also, the design in question doesn’t include a battery for storing the rainwater-generated electricity, making it seemingly only functional when it’s actually raining. And, of course, there’s the issue of the abuse a device like this would take, being in the middle of the street and run over countless times every day by extremely heavy vehicles. To manufacture a solid, unbreakable manhole cover with the capability to display information to the brave pedestrians who dare to dwell atop it for several seconds at a time, the city would be out huge amounts of cash. Not to mention the massive amount the city would spend settling lawsuits from hapless people who were run over while trying to find a bus stop. However, we think that turning an ugly part of the city into something useful is a very good thing. 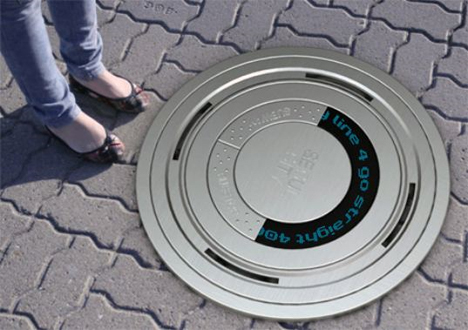 Maybe not manhole covers specifically, but how about a pressure-activated plate mounted into the sidewalk at key pedestrian corners that would do the same job? Photovoltaic cells could provide the required energy, or kinetic energy from passing walkers could even be used to power the displays. Besides being helpful, excess generated energy could be put right back into the city’s power supply. Win-win.